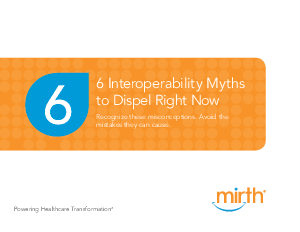 > Research Library > NextGen > Free eBook: 6 Interoperability Myths to Dispel Right Now! Recognize these six misconceptions that can harm your success. Don’t be “fuzzy” about interoperability and sharing data. Misinformation abounds. Get the straight scoop and the right start to your interoperability plan. Robust interoperability is critical to sustain and grow your organization. It’s the top priority of the Office of the National Coordinator of Health Information Technology (ONC). It should be a high priority for you too.